Sorority recruitment this past weekend comes after a year of widespread attention to a few pledging instances around the U.S. that went horribly wrong. 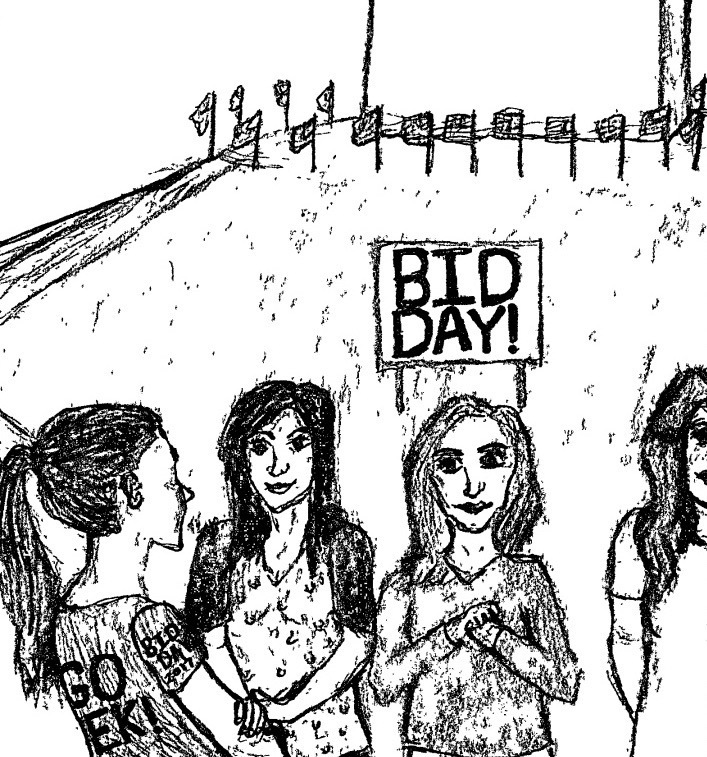 Many eager freshmen will finally get the chance this month to receive a bid from a fraternity or sorority. And as they join the ranks of these organizations, they will have the potential to ensure nothing similar ever happens on our campus. In the last year, a national spotlight has been placed on Greek life following several tragic hazing- and alcohol-related deaths at prominent universities around the country. These tragedies have even led some of these schools – like Penn State, Florida State and Louisiana State universities – to suspend fraternities or even all Greek life activities. Just this month, it was announced that national sorority leaders and administrators are planning to make new recommendations in an effort to resolve the issues that have plagued the Greek system in recent years, including hazing, alcohol abuse and sexual assault. While only one member of The Hatchet’s editorial board is in Greek life, about one third of the student body at GW is involved in fraternities and sororities. As a result, it is important to be proactive toward issues such as hazing, sexual assault and alcohol abuse. Though there haven’t been instances where students have died from pledging themselves to Greek life here in recent years, that doesn’t mean this cannot happen in the future. But the news of national tragedies shouldn’t discourage students from joining Greek life if continued action is taken to prevent these scenarios – and this starts with the new members. The University is far from immune to issues that have plagued Greek life nationally. Since 2014, more than 20 Greek organizations – including chapters in the Panhellenic Association, the Interfraternity Council and the Multicultural Greek Council – have been sanctioned for violations. In that period, four fraternities and one sorority chapter were shut down, with hazing and alcohol violations often cited as the reason. Now that the first-ever session of deferred recruitment for Panhel is almost over, there will soon be a new generation of brothers and sisters in Greek life. This is the time to rebuild a relationship with the University through better communication, where the two can work together to establish and publicize strict and clear reactions to serious allegations that arise. The new generation of fraternity and sorority members can focus on finding ways to make and implement effective change that will improve the future wellbeing of all of its members. Recently, GW, Panhel and IFC have been proactive in increasing preventative measures as well as responses to possible future issues or incidents. Last year, Panhel started a task force specifically to address sexual assault after increased numbers of sexual assaults and reports of drugging at social events that were held by IFC members at the University. Last May, the IFC also mandated sexual assault prevention training for all fraternity members. Some sororities and fraternities also already participate in preventative workshops with student organizations like Students Against Sexual Assault, which can be informative and helpful for the students who attend them. But inevitably, students who are most likely to be willing to attend them are the ones who will not engage in these behaviors, which still leaves the problem mostly unresolved. The University should now focus on improving reactionary measures to these issues. GW needs to continue to be strict toward incidents like hazing, sexual assault and alcohol abuse. GW can do that by making it clear that sororities and fraternities will be investigated thoroughly should something happen by providing more information than what is written in the student handbook. However, if administrators are going to be strict on Greek life, as they should, then it is crucial that additional unnecessary resentment between the University and fraternities and sororities does not arise. Historically, there has not been a high level of trust between the two. Some fraternities and sororities may feel that the University is watching them more closely and coming down harder on them for offenses like underage drinking. While there is more opportunity for this to happen to students in Greek life due to the larger number of social events they typically host, the reality is that sanctions can be issued to any student organization that breaks the rules. Administrators should make an effort to create more positive communication with fraternities and sororities, instead of only playing the role of the disciplinarian. Trust can be created between fraternities, sororities and the University if they all focus on the most pertinent issues. That can start with transparency from the University when it comes to Greek life. GW maintains a webpage where information is posted about which student organizations had incidents of hazing, but it must be better advertised during recruitment and throughout the year so students know that it exists and where to find it. Publicizing this list provides important information for prospective brothers and sisters and fosters a sense of accountability toward the sororities and fraternities. GW has shown that they have an interest in further developing and redefining Greek life on campus. Tau Kappa Epsilon, which was kicked off campus in 2014, returned to campus this semester, and three more chapters that were previously suspended will be returning within the next four years. Two Greek organizations will also launch chapters for the first time at GW in spring 2019 and spring 2021. With new chapters comes new opportunities to build better relations. The University has shown that Greek life is not going anywhere. Now that chapters will be welcoming in new members, it is vital that the University – as well as the sororities and fraternities themselves – take the necessary steps to avoid becoming another name in the current national spotlight. The editorial board is composed of Hatchet staff members and operates separately from the newsroom. This week’s piece was written by opinions editor Irene Ly and contributing opinions editor Renee Pineda, based on discussions with managing director Melissa Holzberg, managing editor Tyler Loveless, sports editor Matt Cullen, copy editor Melissa Schapiro and design editor Zach Slotkin.